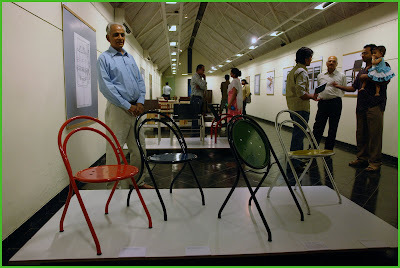 The creative professionals of Ahmedabad have bestowed an honor on the former NID Faculty member and designer Gajanan Upadhayay through a week long exhibition that opened at the Herwitz Gallery on 19th June 2009. The exhibit curated by the HPC Design & Project Management Pvt. Ltd headed by architect Bimal Patel and the TDW Furniture Pvt. Ltd. Headed by Ismet Khambatta and is accompanied by a Monograph titled “Gajanan Upadhyaya: Furniture Designer” which was released by NID Director Pradyumna Vyas at a simple function in front of a very distinguished audience of architects, designers, teachers and students of the Ahmedabad’s creative fraternity. Image01: Inaugural session at the Herwitz Gallery with the monograph launch by Pradyumna Vyas and the brief lecture by Prof M P Ranjan about Gajanan Upadhayay and his design achievements. 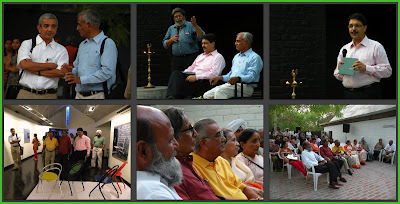 The distinguished audience included architects B V Doshi and Hasmukh Patel, Bimal Patel and Ismet Khambatta and a number of designers and faculty from NID, CEPT and students from these schools. I was requested to speak at the function to introduce the creator and to provide a backdrop that could place the furniture creations in their proper context, a real tall order, when we look at the prolific contributions of Gajanan Upadhayay over a career that spans five decades and his professional experience coincides with the history of design in India and that of NID. I took a few minutes to ponder the question in the morning before the talk and jotted down a few key thoughts that could guide my comments about my colleague of more than 40 years at NID. Yes, we do go a long way together, in the same department and teaching some courses together and working on many joint projects, but still keeping our own separate identities and in some cases, points of view that differed in many ways. Whichever way I look at GU, as we have fondly called him, both his students and faculty deeply respect him for his work and it was no easy task to summarise a lifetime of work that stands tall in my view comparable with the worlds best in the field of furniture design. This small documentation of GU’s work is I believe the first in a long series of future publications that will unravel the mysteries of the man and his work that is as yet unknown to design circles outside a small band students, faculty and associates at NID and other associated designers and friends from Ahmedabad and other parts of India. Image02: Inside the Herwitz Gallery a view of furniture designed by Gajanan Upadhayay over his career spanning from the early 60’s till date. I divided GU’s career into four distinct stages. His first stint at NID as a young designer and architect trainee in 1962 to 1965 when he interacted with Gira and Gautam Sarabhai being introduced to the idea of design that was flowing into NID through the regular movement of great designers from Europe and America in those days. GU worked with some of these designers and drew inspiration from their work to make the first tentative explorations into fine furniture design. Even these pieces were exquisite and he was selected by NID to do a stint of formal training at the Royal Danish Academy of Fine Arts in the Furniture Design department, perhaps the best place in the world in those days for the deep study of furniture design. At NID he had the opportunity to work and be exposed to the concepts of great world designers such as Charles and Ray Eames, George Nakashima, Louis I Kahn and Hans Gugelot from Hfg Ulm which resulted in two very remarkable ranges of furniture that were prototyped and modeled in those days but never saw production like many NID offerings since Indian Industry was blind to the possibility of design being cocooned in the days of “License Permit Raj” where there was no scope for competition through design but industry survived either through ministerial and bureaucratic patronage or just plain corruption. However, the NID documentation of the days credited the works to the visiting consultants and the young Indian designer was denied the credit due to him, but this has been corrected in the new monograph. I admired the “Round Stick Furniture” inspired by Louis I Kahn and the the “24/42 Furniture” inspired by Hans Gugelot when I came to NID as a student and nobody could tell us more about the people and circumstances under which these items were designed although Gajanan Upadhayay was spoken of in whispered tones and he was already a bit of a legend in those days since he had jumped ship and stayed on at the Danish Academy and not returned to NID as he was expected to. Image03: A fleeting glimpse of the pages of the monograph showing the range of work done by Gajanan Upadhayay shown here as six groups of four pictures each from top left to bottom right: 1. Early work at NID and Denmark, 2. NID Classics from the early 80’s, 3. Library stackable chairs for NID, 4. Metal range for canteen and Board Rooms and Hostels, 5. New range for TWD in the 2000’s, and 6. Institutional furniture for schools, management school and the High Court at Ahmedabad. He did return briefly to Ahmedabad in 1968-69 before he returned to Denmark to continue to work as a teacher and designer in close proximity with the great Danish Furniture designers of all time for a long stint of eight years before returning to Ahmedabad to settle down if you can even describe him as settled at any time or place. This was his second important phase of work, which is the Danish phase from 1966 to 1974. Working at the Royal Danish Academy of Fine Art in Copenhagen closely with some and influenced greatly by the Danish greats of Poul Koerholm, Hans Wagner, Borge Mogensen and Nils Fagerholt besides others and he imbibed the finest traditions of Danish furniture design and construction and he also worked on drawing and making the design expressions of these designers professionally while working with them in school and in their studios while absorbing the values of the structural logic and design principles that are deeply ingrained in his own work ever since. On his return to India in 1974 he soon realized there was little scope for design as a professional occupation those days since nobody was willing to pay for design, not industry. He joined NID as a faculty in 1976 and I too had returned from Madras in the same time to rejoin NID and we seemed to have many interests in common. We criticized the existing Foundation course of Geometry and were immediately asked to reformulate it and conduct it for the 1976 batch of the NID Foundation programme. This course is still being conducted in the manner that we had planned and evolved keeping all the assignments of drawings, paper models and geometric concepts in much the same way as it was offered then. Geometry and structural logic are the striking features of GU’s furniture design work and this is what he tries to instill in his students as they interact with him. 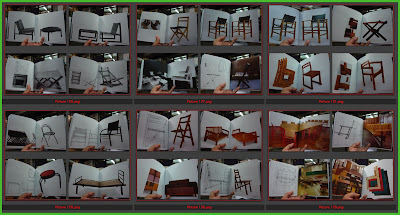 Image04: Canteen chairs used for a poster at NID in the late 90’s to showcase the Furniture Design Discipline at NID shown alongside thumbnails of the pictures that I had captured towards making of the poster seen on the right. This period from 1976 to his retirement from formal teaching at National Institute of Design (NID) at the age of 60 in 1994 would be for me the third phase of his prolific design career during which he created the wooden classics that are all over the NID campus and the hostels since they were produced in the NID workshops in the first round and in another round in later years the metal range that includes the canteen range, the board room furniture and the metal classroom range were produced here. In the early 80’s we offered the wooden furniture range to the Indian industry through an exhibition at the Trade Fair in New Delhi and Mini Boga took up the license to produce a number of these items through her Taaru factory and shop in New Delhi. In 1986 I traveled with GU to Agartala to make the presentation of the Tripura Bamboo Collection that we had jointly produced and on this visit we went to Katlamara to see the bamboo plantations of pole vault pole bamboos, as we called it in those days. We traveled by local bus, me inside and GU on top of the bus, all the way to Katlamara and we were excited by the possibilities of the material that we saw but we had to wait many years till 2003 when we managed to get limited funding to go again to do a workshop at the BCDI together. The monograph does not however cover all his offerings since it is a very small selection from his vast range of offerings but it is a great beginning and I am sure more will come as a result of this opening. 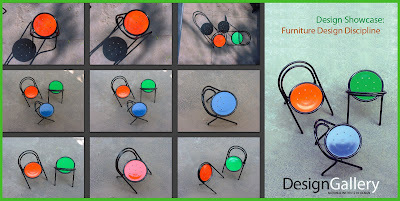 Image05: Gajanan Upadhayay stands behing four distinct versions of the Canteen Chair. Left to right: Fixed frame and non-stackable, Non-folding but stackable, Folding and stackable model (NID Canteen), Stainless steel frame and stackable. Among the last projects that he handled at NID was the design of furniture for the Gujarat High Court that brought him into close contact with Bimal Patel of HCPDPM and Ismet Khambatta of TDW Furniture and soon thereafter he started working as a consultant with Bimal in his office and offering new design ranges to the TDW production and these started appearing in their showrooms as well. This is the fourth phase of GU’s design career and I am sure Design historians will study the impact of Gajanan Upadhayay on Indian design for many years to come and also on his influence on the young Indian furniture design industry which has been impacted by many students from NID setting up their own production facilities, first as small scale ventures which have by now grown into fairly substantial and sought after production houses in Bangalore, Jaipur, New Delhi and other cities in India. All of them have been strongly influenced by the Upadhayay design logic of modernist expression and fine craftsmanship. At the inaugural lecture for the GU furniture exhibit I spoke about the great furniture designers of the world such as Marcel Breuer and Ludwig Mies van der Rohe of the Bauhaus, Alvar Alto of the Finnish design tradition, and Jean Prouve of France, and Hans Gugelot and Gerd Lange of Germany and I do believe that Gajanan Upadhayay too will be one day compared to some of these international masters when the documentation of his work is done in the same depth and with the critical appreciation that it deserves. Monograph available from HCPDPM, Ahmedabad. Pages 88 plus Cover and Dust Jacket. 2. Exhibition of Furniture at the Herwitz Gallery with inaguration on 19 June 2009 and exhibit showing from 20 to 25 June 2009 from 4.00 pm to 8.00 pm daily. T D W Furniture Pvt. Ltd.